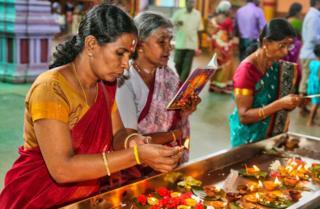 Sri Lanka’s government has agreed to ban the ritual sacrifice of animals and birds at Hindu temples on the island. Look at the last para! The Indian terrorist arm the LTTE are all Hindus who murdered Budhists, Muslims and Christians. Why only Hindu ritual sacrifices? Muslims also doing animal sacrifice heavily above Hindus, where as latter is limited to the festive day, but former doing it equally everyday. All kind of animal sacrifices and slaughter should be banned from this Daham Island. Is govt. in fear of Muslim the Al Qaida, ISIS?